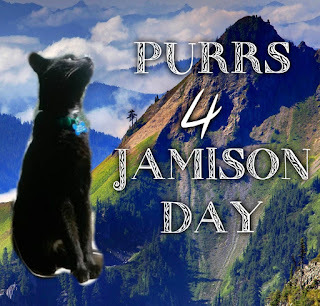 Jamison...just because you weren't the star of Noodle's blog doesn't mean you weren't the star of our hearts. The hearts of your pawrents, your critter family, Blogville, those that you met...why did I imply that it's past-tense? You still are a star to us and you always will be. Your legacy is not just in the past. Jamison...you left way too soon. You were a fighter, but I've learned that no matter how hard you fight, you can't win every battle. Some battles are small, like the battle of trying to get more treats from my humans and the battle of getting an extra afternoon walk. Jamison, your battle was bigger than any of the battles we'll ever have to fight, and we look up to you for being so strong in such a hard time. Jamison...know that your family loves you and misses you. Your pawrents miss holding you and hearing you purr. Noodle and Macy miss snuggling with you and playing with you. I'm sure even Molly misses trying to find out what you even were and I'm sure even Rudee wishes you were here. Jamison...Blogville misses you, more than you could ever imagine. You were, and are, a part of our family. We miss seeing your luxurious chocolate coat and hearing your purr motor on Noodle's blog. We miss reading about your kitty adventures. Jamison...someday I will meet you in the furs. Unfortunately I never got to do that, but someday I will. I'm so sad that you left this world, but I'm glad you're with Angel Katie. Is she telling you stories about the hundreds of walks and adventures we had in just a few months? My little heart feels as if it stops beating when I think of her or catch a whiff of her sweet smell, but I can't help but wag my tail when I imagine her running free and playing with you, Jamison. She loves cats and I bet she's had a lot of fun with you. Jamison...Blogville is on your side today, just like it is every day. We'll meet you again someday, but for now we'll just remember all the good memories we share with you. That is a beautiful tribute to Jamison. Thank you very much for organizing this tribute day and blog hop. We're very sad about Jamison, and are sending lots of POTP to his family. We know this post will warm the hearts of Jamison's family! Very well said. That was a beautiful tribute to Jamison. And you were very sweet to put this special day together. THIS is an AMAZING Tribute fur Jamison. WELL DONE. Such a lovely lovely tribute to sweet Jamison! His pack is just gonna loves this. Thank you so much for puttin' it togethers Chris! you're the bestest!